An Associated Press investigation found that Georgia has 53,000 applicants in limbo, 70 percent of whom are African-American. Civil rights groups sued Georgia Secretary of State Brian Kemp, the Republican candidate for governor who also oversees elections in the state, saying the method his office uses to verify new voter registrations is discriminatory. The lawsuit, filed late Thursday in the U.S. District Court in Atlanta, comes after the revelation that thousands of new applications were placed on hold just weeks before November's midterm election. The filing alleges that Georgia's "exact match" protocol — which requires information on voter registration applications to precisely match information on file with the state's Department of Motor Vehicles or the Social Security Administration — suppresses minority votes in violation of the Voting Rights Act, the 14th Amendment and the 1993 Voter Registration Act. Nonmatching applications are placed on hold. An Associated Press investigation published this week found that Kemp's office has 53,000 applicants pending, 70 percent of whom are African-American, under the "exact match" protocol. Many may not know their voter registration is on hold, the AP said. African-Americans make up 32 percent of Georgia's population. "It imposes a substantial, unwarranted, and disproportionate burden on Black, Latino, and Asian-American voters and denies them equal opportunity to register and to vote in Georgia elections," the suit said. Voters whose applications are on hold have 26 months to correct their application before it's canceled. Voters can still cast a provisional ballot on Election Day. 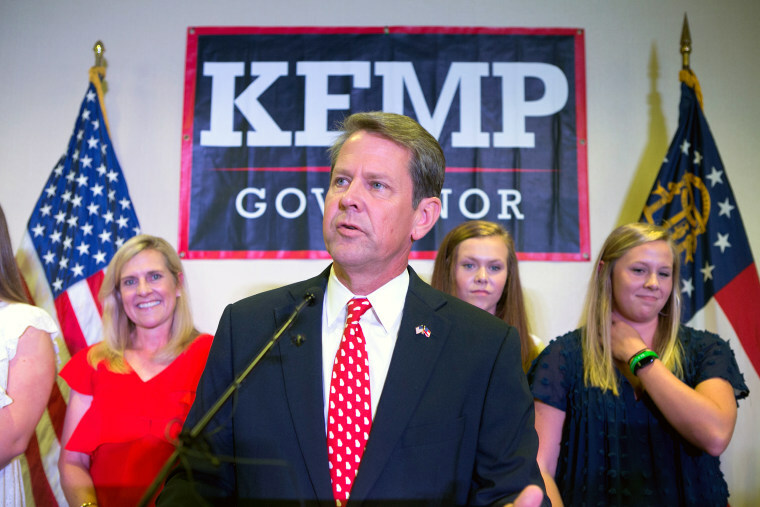 Kemp has denied that his practices are discriminatory. He said his opponent, Democrat Stacey Abrams, was "sloppy" in registering voters through the New Georgia Project, a voter registration group founded by Abrams in 2013. "This is a publicity stunt that the media falls for year after year. Their claims are bogus. It is a complete waste of our time and taxpayer dollars. This so-called 'exact match' law was passed by the legislature and signed by Governor Deal," said Candice Broce, a spokeswoman for the secretary of state's office. "It mirrors a Florida law recently upheld in the 11th Circuit. The 53,000 Georgians cited in their complaint can vote in the November 6 election. Any claims to the contrary are politically motivated and utterly false." New Georgia Project is one of the groups behind the lawsuit. Other civil rights organizations joining the suit include the Georgia Coalition for The Peoples’ Agenda, Asian Americans Advancing Justice-Atlanta, the Georgia NAACP, the Georgia Association of Latino Elected Officials and ProGeorgia State Table. Abrams, in a tweet late Thursday, said her campaign will counter Kemp's policy with a voter protection hotline and will also deploy poll watchers to make sure voters can cast ballots on Election Day. "Let me be clear: We will work to process the 53,000 voter registrations, but we will not wait for justice," she said. Her campaign did not respond to a request for comment.